As we wait for CoolStar’s Electra Jailbreak to get updated for iOS 11.3.1, developer Abraham Masri also known as by his Twitter handle @cheesecakeufo has released Houdini Semi-Jailbreak Beta 3, with support for iOS 11.3.1. 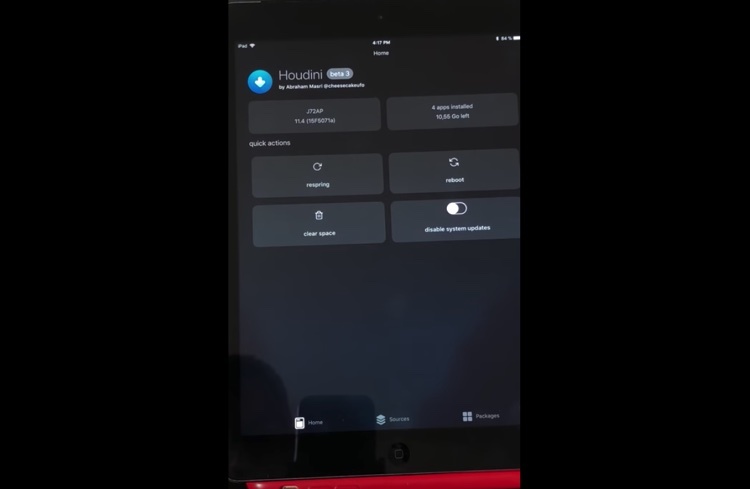 This means if you are running iOS 11.3.1 on your iPhone, iPad or iPod touch you can now install Houdini tool on it. The support for iOS 11.2 to iOS 11.3.1 has been made possible thanks to Ian Beer’s newly released iOS 11.3.1 exploit. The very same exploit is also being used for the development of a full iOS 11.3.1 jailbreak. Masri’s Houdini Semi-Jailbreak is not a full-fledge jailbreak, however it makes it possible for users to apply customizations to their device, something that is not possible in a stock iOS device. This tool does not fully jailbreak an iOS device, however users can still use it to apply themes and other customizations on their devices. Houdini is not like semi-untethered jailbreak tools such as Electra and does not install Cydia on the devices that are running it. It does offer its own interface where users can apply different themes and utilities from. With Houdini beta 3 in addition to iOS 11.3.1 support Masri has been able to add passcode customizations for iOS 11, has re-enabled themes, added ability to customize Control Center and icons, added option that allows users to remove Houdini, added option to disable iOS updates and has sped up the startup time. If you are interested in trying out Houdini tool on your iPhone or iPad, then you can download it for iOS 10 and iOS 11 from developer’s website here.